Ministers held a snap meeting after Kinder Morgan halted non-essential work on its Trans Mountain pipeline expansion. 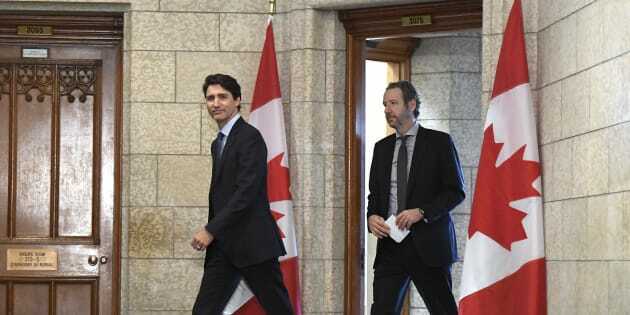 Prime Minister Justin Trudeau leaves his office with his principal secretary Gerald Butts to attend an emergency cabinet meeting on Parliament Hill in Ottawa on April 10, 2018. OTTAWA — The Trudeau government held an emergency cabinet meeting Tuesday aimed at salvaging the Trans Mountain pipeline expansion but did not come up with plan — at least not one ministers are prepared to talk about yet. Hours earlier, Alberta Premier Rachel Notley upped the ante, saying Alberta is not only prepared to invest in the pipeline, it is prepared to take it over entirely if need be. But federal ministers had nothing to say about how their government might convince — or force — British Columbia to back off and allow the pipeline to proceed. "I apologize in advance I've got one minute and I've got to catch a plane,'' Natural Resources Minister Jim Carr said before making a very brief statement following the two-hour cabinet meeting. When asked about Notley's new suggestion of buying the pipeline entirely Carr repeated his comments from the last two days that there are many options on the table and Canada is considering all of them. Environment Minister Catherine McKenna repeated the statement in French and officially that was it. Infrastructure Minister Amarjeet Sohi, whose Edmonton seat could be at risk if the pipeline expansion fails, was cornered on his way out of the meeting. He wouldn't discuss cabinet conversations in public but repeated that the government is 100 per cent behind the pipeline. "We will get it done,'' Sohi said, before pushing out of the scrum of reporters and heading to his car. In a sign of the heat the cabinet is feeling over this, Sohi lashed out on Twitter earlier this week at B.C. New Democrat MP Kennedy Stewart for claiming victory after Kinder Morgan announced it is suspending all non-essential spending on the pipeline until it and its investors feel secure the project won't be derailed by strong opposition from the B.C. NDP government. Finance Minister Bill Morneau said the government is "in discussions'' with Notley, Horgan and Kinder Morgan. He is to meet Wednesday with Notley in Toronto but it's not known whether he, or another minister, intends to meet personally with Horgan. When asked if Canada would penalize B.C. financially if it doesn't withdraw its opposition to the pipeline — something Alberta United Conservative party leader Jason Kenney wants to see done — Morneau clammed up. "We are not going to negotiate in public nor make public threats,'' he said. Finance Minister Bill Morneau speaks at the University of British Columbia in Vancouver on March 6, 2018. Kinder Morgan gave the government a deadline of May 31 to get reassurance for its investors the pipeline will come to fruition. Conservative natural resources critic Shannon Stubbs said she was "flabbergasted'' the cabinet meeting produced no plan. "I think this a colossal failure in leadership,'' she said. Iain Black, a former provincial Liberal cabinet minister in B.C. and now president of the Vancouver Board of Trade, said he is not surprised or disappointed there was nothing concrete out of cabinet. 'I think the federal government is in some new territory here,'' he said. Black said the issue has gone beyond the pipeline itself to a question of if Canada can follow the rule of law to get projects built. If it can't, he said the impact on investment capital will be immense and crippling. He said he has cleared his schedule over the next three days because there is a lot of work underway within the business community in B.C. across all sectors to try and help get this pipeline project built. Black said Trudeau expended some political capital to approve the pipeline and, until now, he has handled the file in a non-confrontational, "very Canadian way.'' But now, he said, the rubber is hitting the road and Trudeau is going to have to be bold. Carr said earlier this week the government has legal, regulatory and financial options but did not specify what they are. Broadly, they include financial penalties for B.C., investing in the pipeline in some way to reassure investors and suing the B.C. government to exert jurisdiction. They could also ask the Supreme Court for a ruling on their authority, however that option was discarded earlier this year because it would be a lengthy process and would imply there is some doubt about who has jurisdiction when Ottawa firmly believes there is none. Opponents of the Kinder Morgan oil pipeline protest outside Liberal Party fundraising event in Vancouver on April 5, 2018. Although Horgan has threatened to pass regulations that could prevent additional oil from flowing through B.C. on its way to foreign buyers, he hasn't done so nor has he asked the courts to rule on whether he has jurisdiction to that. The threat alone has been enough to spook investors and without an actual regulation there is nothing Alberta or Canada can sue over. B.C. is also part of a lawsuit against Ottawa arguing there was not proper consultation with Indigenous communities or other stakeholders when the pipeline was reviewed. A decision in that suit is expected any day. More than 30 Indigenous communities along the pipeline's route support the project but there are many in B.C. which do not. In Ottawa on Tuesday, a few dozen pipeline protesters blocked commuter traffic on the edge of downtown outside McKenna's constituency office. In Calgary, several hundred people turned up to rally in favour of the pipeline outside a provincial government building.